OUR GOAL IS CUSTOMER SATISFACTION. In order to meet that goal, we will ALWAYS work with our customers on any concerns that may arise. In the unlikely instance that you feel the need to open a resolution dispute before working with us, you will immediately be blocked from any further chance to acquire the rare music we present each and every week. Payment is required within seven days. We mail all paid items ONE WEEK after auctions end. Please keep in mind our listings are time consuming in detail and we are often traveling to find these gems, which at times delays the delivery schedule by a day or two. We ALWAYS process and ship every paid order. We have no control over parcels once they are mailed from our local Post Office. Overseas mail to some countries (Italy, Russia, France, in particular) has become very slow. Opening a dispute for slow mail is unacceptable and will result in blocking the bidder. We work hard to provide excellent service as is represented by our 8000 plus positive feedback. 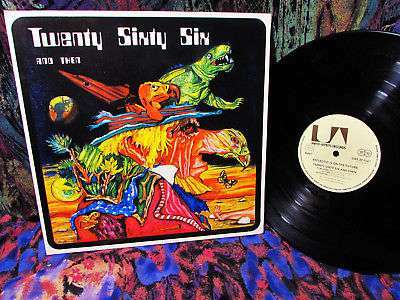 Very scarce (high $ valued pressing as well) ...A long long GONE 1971 United Artists first print in colorful laminated gatefold ... seen sold for multi $ hundreds = SEE FULL CONDITION below , please. TWENTY SIXTY SIX AND THEN ....the name '2066 & THEN' comes from adding an extra thousand to the number 1066, year of the historical battle of Hastings. Their heavy progressive style has been compared to that of the greatest of early '70s Krautrock & U.K. underground bands of the era. 'Reflections on the Future' is their only legacy, and a legendary one that continues to soars with interest and demand. Their record company (Second Battle) re-released the album 25 years ago under the name 'Reflections on the Past'. Considered a collectors item, it also contains the direct to metal masters production which reflects a great wide-range-sound as the first printing. This album is a technical masterpiece of music. All of the songs are fast-paced and pretty heavy. Critics cannot deny the excellence of the music on this album. There really is no point to describing each song, individually, as they all sound very similar. That is, perfect. Without any harsh, or dull moments. From one music critic, to another, do not pass this one up. Geff Harrison has a wonderful (slightly raspy) voice, that fits this album, in every way. His voice, along with the rhythm, ebbs and flows in an almost haunting way. Next, it pains to say this name in the same review with this album, but-Eddie Van Halen, would be put to shame by the guitar work of Gagey Mrozeck. And...did someone say Neil Peart can play drums? Hah! Mere child's play compared to Konstatin Bommarius' flawless drumming. The bass of Dieter Bauer is also exemplary. If all that's not enough for you, Steve Robinson and Veit Marvos are equally as proficient on the ivory. The whole damn album is practically a keyboard/guitar dualing solo, and once you think the heaviness of the vocals, drums, organ, bass, and guitar is about to be overwhelming, and about to make you explode with adrenaline-you get a soft, psych, break, before the finale. Cutting to the chase: This is a dark, deep, heavy, progressive, and psychedelic album, all in one. Don't let that scare you. We haven't any doubts, that anyone who cares about music, in general; will have one of the following reactions; Really like/Probably love, and/or certainly appreciate this album. Without a shred of hesitation-this is one of the best albums ever made. CONDITION: The cover is rated: M- nice glossy laminated gatefold has been well handled ... no problems, should fit well into most any collection...original store sticker on inside (photos...) This is a TOP COPY cover for sure... no bends, no writing, no splits, no deletes, no scrapes, no lamination peeling, etc. TOP! A GREAT ADDITION TO ANYONE'S COLLECTIBLES! NOTE: All Itemsbacked bymoney back guarantee! for you BEFORE leaving negative feedback. Thanks!